A new edition of the Annual Literacy Research and Policy Guide 2018/19 is now available covering the latest research findings and guidance. The 2017/18 editions remain available on this page for reference and to catch up on any information you may have missed. 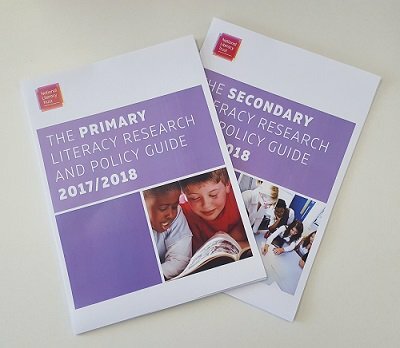 The Annual Literacy Research and Policy Guide sits alongside our Annual Literacy School Review and our Annual Literacy Pupil Survey. Together this Literacy Toolkit provides a comprehensive suite of materials to support evaluation, reflection and ongoing strategic development of whole-school literacy. Updated every year, these three essential publications can be built into your annual school-improvement cycle to provide a gateway to good practice that is informed by evidence, in line with policy and inspired by practical ideas. A set of posters to help you evaluate your current literacy provision and develop an action plan for moving forward.